Want a snazzy colored risotto for your Valentine? Make it with red wine! I wanted another risotto, but alas, I didn’t want something cream-laden (lactose intolerance!) or heavy. Is it weird to want the comforting heavy food and not want it at the same time? I think it’s because it’s winter, so it’s cold out, but I don’t want to sweat off any more winter weight come spring time. So, I solved this problem by making a very comforting, hearty risotto, but left out the cream (used red wine instead) and left the parm for just a sprinkle on the top. And do you know what? It was just as decadent and delicious! While it does call for a whopping 3 T of butter, keep in mind this is a larger recipe. 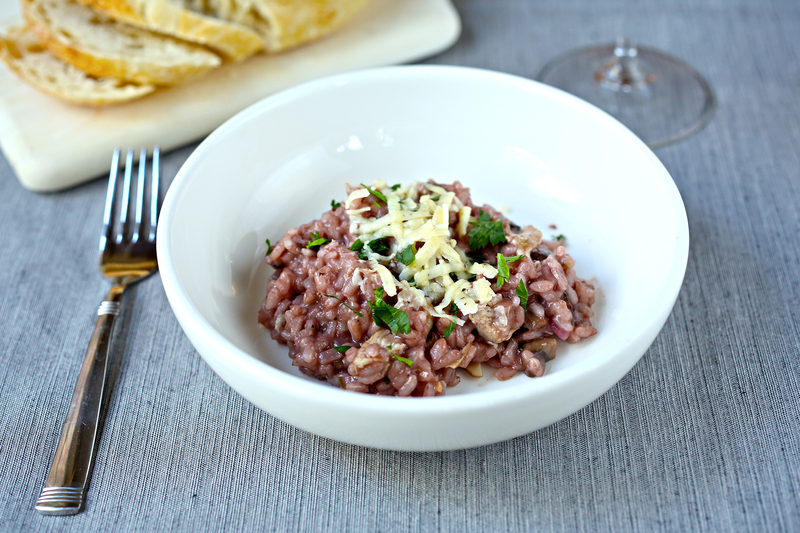 Risotto is a great thing to make with wild fowl, for a couple of reasons. The richness of the birds can stand up to a stout risotto, even one made with red wine. Wild fowl also tends to be on the smaller side, so it stretches your bird if you’re feeding a crowd. As I often lament over, El Gallo’s eating habits have actually been referred to as a spectator sport. There’s nothing worse than slaving over coq au vin for 3+ hours only to see someone inhale the whole thing in 8 minutes flat. This is why I made a larger recipe, using 3 cups of risotto. This did mean the cooking and stirring took a little longer, about 30 minutes instead of 20. There is something somewhat cathartic about making a risotto. Pour yourself a glass of that red wine, play some of your favorite jams, and you can get lost in the harmony of stirring, and adding liquid and sipping wine and stirring, etc, etc. It’s not difficult, and you can drift away as the delightful smells of mushrooms and wine and garlic drift through your kitchen. Then, whether you’re cooking for yourself or a dinner party, you have this decadent yet simple dish to dig in to. Melt 1 tablespoon of butter in a pan over medium-high heat. Pan sear the pheasant on all sides, then flip breast up, cover, and cook until cooked through, about 10 minutes. Remove to a plate, cover with foil and let rest until cool enough to handle. In the same pan, deglaze quickly with a shot of red wine. Add the mushrooms, garlic, sage and 1 tablespoon of butter and sauté on medium-high heat until the mushrooms start to turn golden. Then set aside. Heat the chicken broth. Melt the last tablespoon of butter in a large pot over medium heat. Add the onion and cook until translucent, about 5 minutes. Add the rice and stir to coat with the butter and onion. Add 1 cup of wine and stir until completely absorbed. Repeat with the second cup of red wine. Then, ladle the warm broth into the pot one ladle at a time and stir until all the liquid is absorbed. 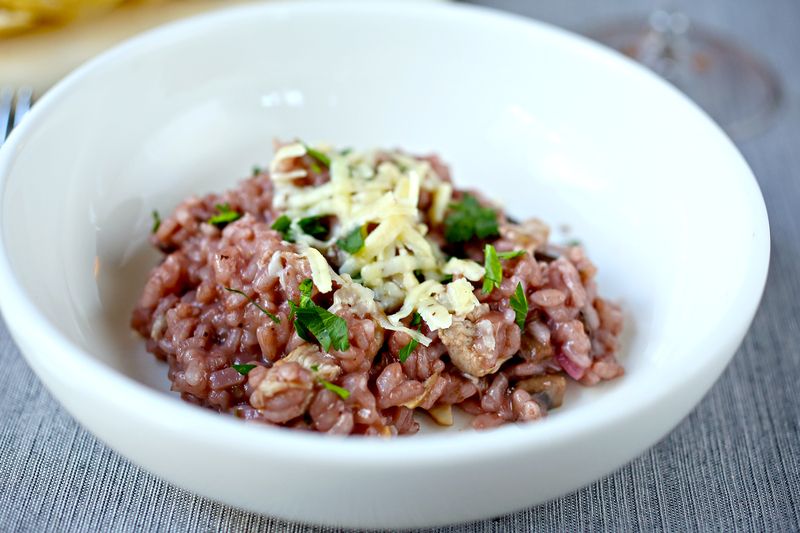 Repeat this process until the risotto is tender. This will take about 30 minutes. When ready to combine everything, pull all the meat off the bird and roughly chop into bite sized pieces. Once the risotto is tender, add the mushroom sauté, the zest and juice of the lemon, and the pheasant and mix well so it's all warmed through. Garnish with cheese and serve warm. Non-game substitution: Chicken is the obvious go-to here. I won’t even tell if you just chop up one of those rotisserie birds from the grocery store.